In bitterly cold weather, a Russian Soyuz rocket carrying a three-man all-veteran crew blasted off from the Baikonur Cosmodrome in Kazakhstan Wednesday, streaking into orbit and setting off after the International Space Station to boost the lab's crew back to six. With commander Oleg Kononenko at the controls in the ferry craft's center seat, flanked by European Space Agency astronaut Andre Kuipers on his left and NASA astronaut Donald Pettit to the right, the Soyuz TMA-03M's booster roared to life and climbed away from its snow-covered launching pad at 8:16:15 a.m. EST (GMT-5; 7:16:15 p.m. local time), roughly the moment Earth's rotation carried the launch site into the plane of the station's orbit. 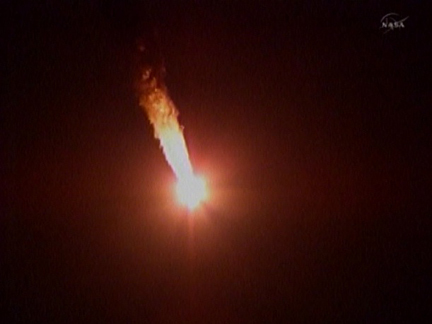 Trailing a brilliant plume of fiery exhaust, the workhorse rocket climbed away through a clear, dark sky, arcing to the east as it accelerated toward space a little more than an hour after sunset in Baikonur. Spectators braved temperatures near zero degrees Fahrenheit to watch the rocket's ascent. 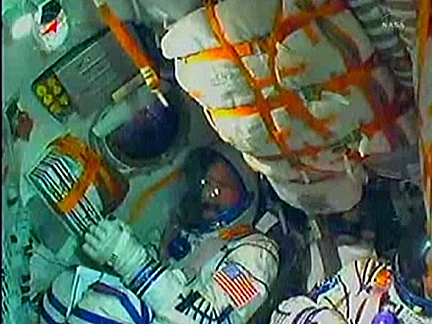 But it was comfortable inside the Soyuz and live television views from inside the spacecraft's central command module showed the crew members as they monitored the automated ascent, all three looking relaxed in their white spacesuits. The rocket appeared to perform flawlessly and about nine minutes after launch, the Soyuz TMA-03M spacecraft separated from the booster's upper stage and slipped into orbit, its solar panels and antennas unfolding as planned as it set off after the space station. "Congratulations, guys, on a good insertion, (there are) no issues with telemetry or anything at all at this time," Russian mission control called. "We wish you best of luck. You are experienced people, I'm sure everything is going to go very well." Kononenko plans to oversee an automated approach and docking at the station's Rassvet module at 10:22 a.m. Friday. Standing by to welcome them aboard will be Expedition 30 commander Dan Burbank, Soyuz TMA-22 commander Anton Shkaplerov and flight engineer Anatoly Ivanishin, who were launched to the outpost Nov. 13. Burbank and his crewmates originally were scheduled for launch in September, with Kononenko, Kuipers and Pettit following at the end of November. But the Russian launch schedule was disrupted after a Progress cargo ship was destroyed during launch Aug. 24 when its third stage engine, virtually identical to the one used in the manned version of the Soyuz booster, malfunctioned and shut down before the craft reached orbit. An investigation concluded the shutdown was triggered by contamination in a propellant line. Engineers carried out extensive inspections of downstream engines and implemented improved quality control procedures before the Russian federal space agency successfully launched another Progress supply ship Oct. 30. 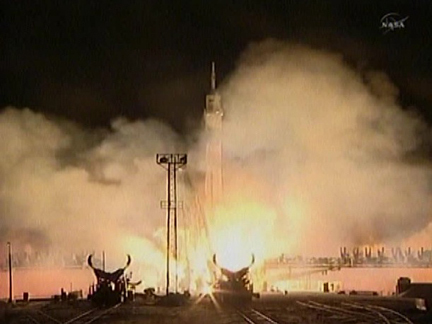 The Soyuz TMA-22 carrying Burbank, Shkaplerov and Ivanishin was safely launched Nov. 13. "The Russians are good engineers, and they know how to make their hardware, they know how to fix their hardware when it doesn't work right," Pettit said in a pre-launch interview. "But all of this falls in the category of riding rockets is a risky business. If you want to be able to venture into space at this point in time, you've got to ride a rocket and if you want to participate in exploring that particular frontier you just have to roll your dice with the universe and do the best you can." The original plan called for a second test flight to demonstrate rendezvous procedures, with berthing carried out during a third and final test flight. But earlier this month, NASA agreed to let SpaceX combine the second and third test flights into a single mission. Unlike cargo ships supplied by Russia and the European Space Agency, the commercial craft built by SpaceX and Orbital Sciences will be pulled into port by the station's robot arm. For the planned berthing in February, Burbank and Pettit will operate the station's robot arm and communications gear.